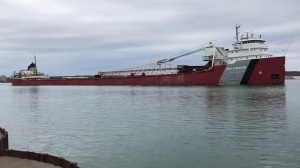 The oil-to-water lubricated tailshaft conversion Thordon Bearings carried out last year to the 26,260dwt Great Lakes Fleet-managed bulk carrier SS John G. Munson has successfully completed its first season as a diesel-powered ship. The John G. Munson was built more than 64 years ago by Manitowoc Shipbuilding and lengthened in 1976 by Fraser Shipyard as a Great Lakes steamer. A global leader in seawater lubricated propeller shaft bearing systems, with over 35 years’ experience in this technology, Thordon Bearings is renowned for supplying high performance, oil and grease-free bearing systems to the global marine, clean energy, pump and offshore markets.